Calculations of fluid mechanics can achieve infinite degrees of complexity, which we avoid limiting us in the concrete and practical applications. The purpose of this site is to initiate providing software and tools ludic reflection, fast and applied to specific projects. By navigating through links with curiosity, you will develop a basic understanding of fluid mechanics that will serve you every day for your projects. 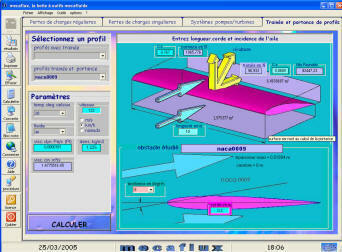 Mecaflux standard software is developed in a spirit of pedagogical simplification. Whatever your theoretical level, in a few clicks, you enter your data and anticipate the consequences of your technical choices. Economic in: parameter assignment times , no drawing required, and price $ 93 (on line download). a helping hand at the right time in your calculations of pressure losses, pumps, aerodynamics , hydrodynamics aeraulics and hydraulics. (Tool for converting physical units included). The calculation of losses plumbing in a pumping system is an example of calculations of internal flows in fluid mechanics. 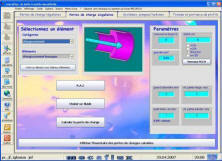 Le calcul des pertes de charge de plomberie dans un système de pompage est un exemple de calculs de flux internes en mécanique - fluide.